September | 2014 | How to love Igbo things (or what you will). 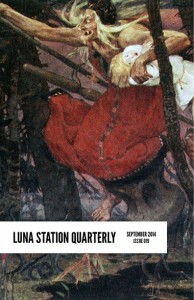 Another short story in Luna Station Quarterly. I really enjoyed writing this story, I love how the protagonist appeared out of nowhere in the dead of night. It was as if she was waiting for my mind to be exhausted enough to drop its defences and let her in. I did and I do not regret it. She is bawse; sly, smart, slinky, sensual and sensitive. I kinda have the hots for her. I love the relationship between both main characters. I hope this feeling never gets old. I hope I never stop feeling ecstatic that more people will get to read my stories. I hope that I will always find someone who wants to publish my sci-fi/weird fic/spec fic/whatever-the-hell-fic-you-choose-to-call-it. I hope people will enjoy reading them. You can find my story here and access the full index of weird and wonderful here. Remember, if you’re a woman writer and meet their criteria, Luna Station want you. They are currently closed for submissions but if you leave your contact details, you will be notified when they open again.